This circular astronomical compendium was made by Melchior Reichle, of whom there is only one other instrument known which is also in the British Museum collections (Epact 94075). It consists of a nocturnal for different latitudes, a converter for solar and lunar time, an equatorial pin gnomon dial, a magnetic compass with the main directions and weather indications and a list of latitudes. 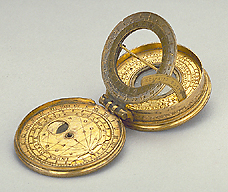 The layout of the dial is very similar to a universal equinoctial dial by Cornelius van den Eedt (Epact 47795).